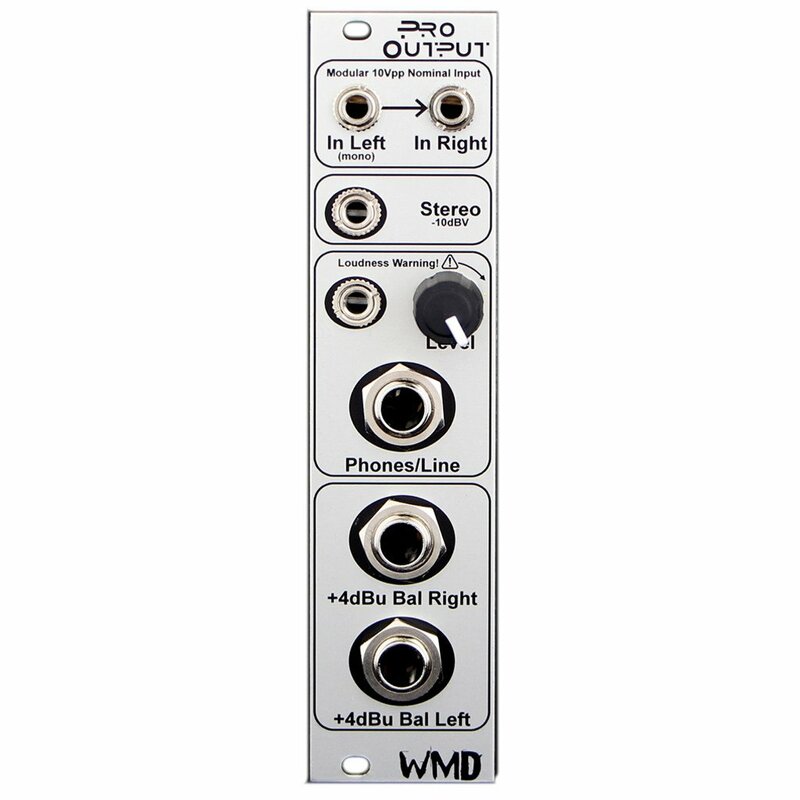 The WMD Pro Output is a simple and purpose built module to get your modular signal interfaced with professional and consumer audio gear. It also includes a very high quality headphone driver. Rail to rail opamps at the input stage allow for headroom above the typical eurorack levels of 20Vpp. The Pro Output can handle 23Vpp before clipping. Signals are attenuated down to the proper levels allowing for simple adjustment free connection to any type of device, professional or consumer. The Pro Output is DC coupled through the entire signal path, including the headphone driver. This design eliminates coupling capacitors and the distortion they can cause. Input - The inputs are designed to accept any normal modular level. 10Vpp is the nominal operation level. The left input is normaled to the right side for mono operation. Inputs will clip at 23Vpp, giving enough headroom for any eurorack signal. Phones/Line - The headphone driver connects to a 3.5mm stereo jack, and a 1/4" jack for whatever type of headphones you use. It can drive both simultaneously. The headphone output level is internally limited to protect against accidental knob turns. Connect a couple of jumpers to the rear of the module to disable this limiting. This will allow the headphone amp to drive headphones extremely loudly, but still without distortion. Output quality remains the same regardless of the jumper settings. With the limiting enabled (jumpers off), the maximum output is around -10dBV. With limiting disabled (jumpers on), the maximum output increases to pro level, about +4dBu. Stereo - The Stereo (-10dBV) output is designed to interface directly with consumer level gear. Hook directly to sound cards, portable recorders, and speakers. It can be used as a second headphone output but will be loud. +4dBu Bal - These two outputs (left and right) are high quality low impedance balanced line drivers. They are designed to drive long cables and to drive balanced transformer or transformerless inputs. Use these to connect directly to mixing consoles, mic preamps, or any other piece of professional outboard gear. The Pro Output is 6 HP. Current consumption is 60mA for the +12 rail; 60mA for the -12 rail. The depth from the back of the panel is 39mm. The Pro Output is warranted for 12 months after purchase. But please contact us if you ever have problems. We will take care of you.